Jailbreaking your WP7 phone isn’t all fun and games, and while there are many legitimate and useful things you can do with your phone when free from the strict controls of Microsoft, there are also plenty which are less pleasant. 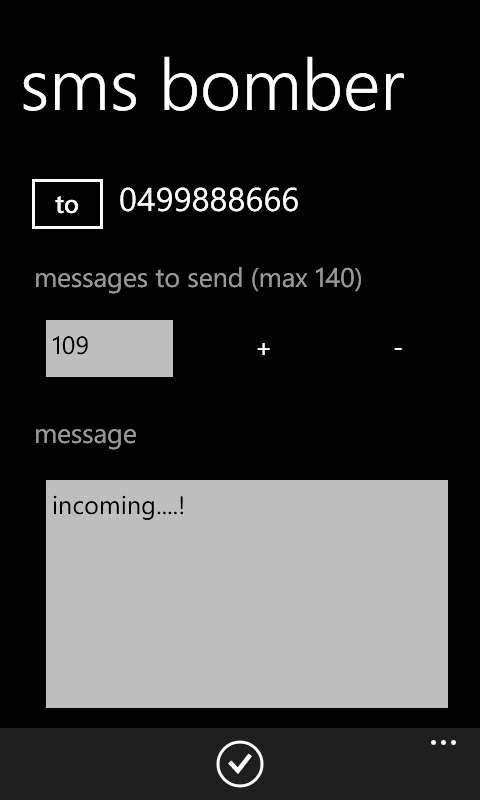 For instance, meet SMS Bomber, an app available to those who have jailbroken. According to the developer SMS Bomber is an app used to select a contact and repeatedly send the recipient messages over and over again. The application supports sending up to 140 messages (a strange limitation on Windows Phone 7′s part)… Unfortunately the application was rejected by Microsoft citing concerns that a consumer could easily rake up an unanticipated bill etc. That’s right, it sends up to 140 text messages to a victim, overwhelming their monthly message plan in short order (and yours too, unless you have unlimited). Why would someone make this? Every now and again we like to do things which push the boundaries of standards and policies. Sometimes these work and sometimes they don’t.